So I've talked about many money saving tips but today I want to share how to save money on meat. I'm sure I have mentioned this before, but I was at the store earlier today and was asked about this, so I think it bears repeating. I was searching the meat section today and found some hamburger meat on manager markdown and bought the last (3) 3lb packs. Then a lady shopping by a list and coupons in hand asked why I was getting only meat with the orange stickers (the manager marks down stickers) I had a few other packs in the cart as well. So I explained, I only buy meat on mark down and here's why. This is meat that is being marked down because it is nearing its sell-by date. This does not mean the meat is bad, not AT ALL! The grocery stores have regulations that they can only have the meat out to sell in refrigerated areas for X amount of time. When this time nears, the stores would rather take a hit on the meat then throw it away and get paid nothing. Think of the managers markdowns as the clearance section right after the holidays. I take this food home, and either cook it up that day or freeze it right then. It's still good frozen as long as non-marked down food! This was a 3 1/2 pound package of hamburger meat for $5.58, down from $7.99. I did a quick calculation to figure out that means about $1.59lb! That's $0.40 less than my stock up price, during a rock bottom sale! So I grabbed the last 3 packs that were marked down within a few cents of each other and came home separated them into 1lb bags and froze them. That's 10 meals worth for $15!! I also picked up 2 packs of round eye steaks for $2.50 each, a pack of Denver steaks for $1.99 and a pack of chicken wings for $3 that was enough to make 2 meals worth! 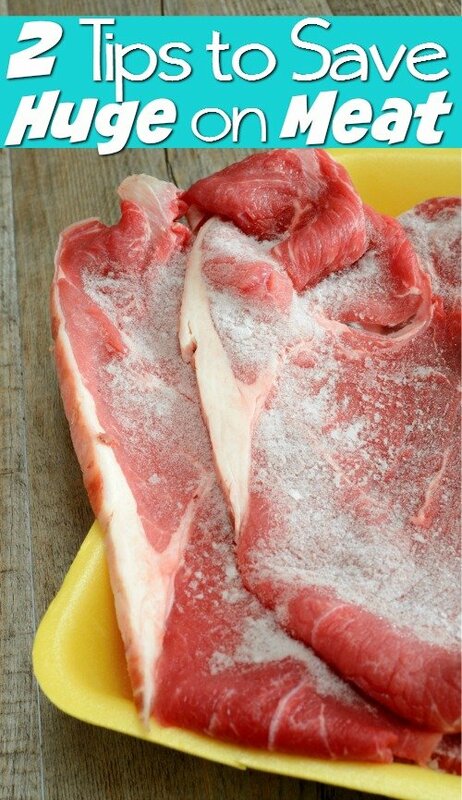 I still buy meats while they are on great sales like $1.99lb for boneless chicken breasts etc., but I also buy meat like this, freeze them, and I have a nice little stockpile of meat! Now another trick I use to save money is an online one. Not all meat is a great deal in my area of the country, and I have heard things like outrageous bacon prices in other parts of the country or not being able to find ground chuck for under $4 a pound. OUCH! So if you are having this problem, no fear! If you have a hard time finding a good deal on meat check out Zaycon Foods, sign up, it's free and take a look around. You buy in bulk and pick it up at their drop off location, normally a church parking lot. The chicken breasts are huge and at a price lower than my stock up price! You can see my review here. Some prices won't work for you in your area like for me the bacon prices are more than what I get locally. But for a friend of mine in Texas the prices for her are less than she can get locally. So there you have it my big money saving tip. My 2 ways to save a great deal on meat! How are you saving money on meat? I had read a lot about Zaycon Foods, got brave and tried it. I’m happy with what I got and the price I paid. Then I decided to order the ground beef, and found out they had gone out of business, leaving farmers and customers alike who had either put up product or paid for product with nothing to show for it. It’s sad because it was a good idea. Yes, I had forgotten I mentioned them in this post. I had ordered several times with them. Always had a great experience. I know the partners who started the company split a few years ago and one was trying to make a competing company that never got off the ground I just wish there was a good substitute for it!